Well, yes if we’re referring to the “Summer of Riesling,” a now iconic program at restaurants and wine bars nationwide to use the June 21st to September 21st period of warmer days and nights to get you the skeptical wine drinker to drink the much maligned grape. “It’s too sweet.” “It’s too dry.” “It’s too much like slate.” It’s not buttery.” “It’s boring.” “I only drink it with Chinese takeout or spicy food because it’s like alcoholic fruit juice.” Those are among the common excuses drinkers relegate Riesling to couch class status, in the same illustrious company as Pinot Grigio and White Zinfandel. Hey, I’m one of those in the guilty Riesling-bashing party. I’m that guy who immediately looks for Oregon Pinot Noir, strange Rhone varietals, and boutique California Chardonnays. I don’t look for Riesling. Recently at a (New York Times four star) restaurant in Manhattan, I took the initiative of ordering a glass of Finger Lakes Riesling to try and learn more about the nearby region. It was fine, maybe a bit more sweet than floral or expressive of minerals. My other tablemates all had a beautiful Qupé Chardonnay from Santa Barbara County. My wine was fine, but I felt left out as if I was not invited to the elegant white wine party. 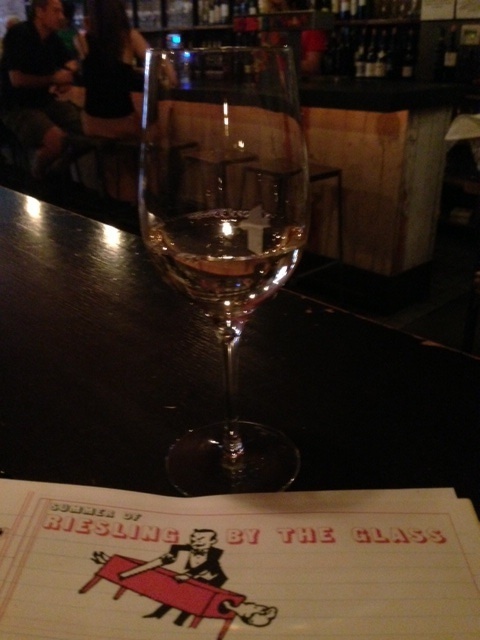 Then I decided to experience the Summer of Riesling at the source, the TriBeCa wine bar Terroir. Over 500 establishments are now part of the program that is “a love affair with the world’s greatest grape expressed in full Technicolor.” By rule, each establishment must include 3-4 Rieslings by the glass all summer long and for July, at least 2 of those must be from the grape’s homeland of Germany. Got it? Paul Grieco, the mastermind behind the runaway successful wine bars Terroir in New York (if only every wine bar was as fun, unique, and approachable as Terroir…), started the Summer of Riesling at his original East Village Terroir in 2008. It feels like a century ago, not 5 years ago. Recently at his TriBeCa outpost, I became a Riesling believer. Of the 24 Rieslings by the glass (a 2012 Sheldrake Point from Cayuga Lake or a 2011 Left Foot Charley from Traverse City, or a 2011 Später-Veit Feinherb from Mosel? ), it was the 2011 Trocken Riesling from Okomomierat Rebholz that was chosen for me and opened my world. “Trocken” might mean “dry,” but this was an example of crispness balanced with ripe fruit. A few mineral notes helped the wine veer towards the typical slate dry direction, but it was much more vibrant than being merely dry. This was a wine with punch. Amontillado Sherry even came to mind from the well-rounded sweet nuttiness. Don’t have this with jazzy spicy cuisine. Savor it. The winery makes Rieslings at three times the price in the $70 retail range, except you’d fool me into thinking this is one of those. Rebholz is a third generation Pfalz winery. It’s relatively small at 6,000 cases and roughly 34 acres of vines leading to about a 35% Riesling yield. It’s quite an honor to be one of the most renowned winemakers in the Pfalz, Germany’s second largest wine growing region (a small Riesling heavy area in the extreme west of the country near Alsace, France). With all of this Riesling talk, there’s no escaping Terroir without other samples. I’ll give several rounds of applause to Terroir for serving each wine in 3 and 6 ounce pours. Consider Terroir your independent sommelier school. Learn about the spicy, dry St. Laurent grape in the 2009 Wimmer Czerny Traditionnell from Wagram, Austria. It’s a downright crime and absurd bargain that at least one Sherry on the list goes for $2 a glass during happy hour. And this isn’t Christian Brothers Sherry. 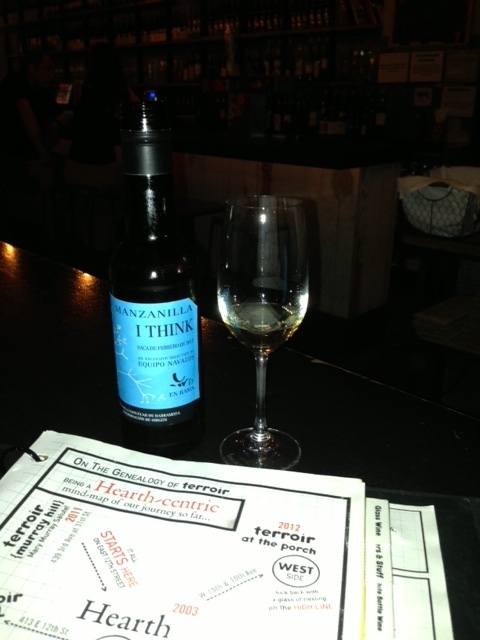 I’m talking about the beautiful, honey coated, mineral driven Manzanilla called “I Think,” from the Equipo Navazos in Sanlucar de Barrameda. It deserves to be the most popular Sherry imported by my esteemed colleague at Vino 24/7 Justin Berlin. Listen to Grieco and his Terroir concept. Wine is for the people. Test yourself and trust others. Definitely go for the Sherry. And I’ll even listen to him now thanks to the Rebholz Trocken Riesling. It might not be the world’s greatest grape, but it certainly is one of them when you hit the perfect sweet and dry balance. This entry was posted on September 18, 2013 by trevsbistro. It was filed under Cities .